Western blot analysis of extracts of various cell lines, using MTA2 Polyclonal Antibody. MTA2 (metastasis-associated protein) is a component of NuRD, a nucleosome remodeling deacetylase complex found in the nucleus of human cells. It demonstrates a very wide expression pattern and is highly expressed in various tissues. MTA2 represents only a single member of a small gene family that encode distinctive but related proteins involved in transcriptional regulation (either directly or indirectly). Chromatin remodeling may be an indirect effect of their transcriptional regulation. MTA2 is very similar to and shares domain types with another member of this family, a protein associated with metastatic carcinomas potential. The shared domains include two DNA binding domains, a dimerization domain, and a domain generally found in proteins that methylate DNA. A target protein for this gene is p53, and deacetylation of p53 is associated with reduced growth inhibition in transformed cells, thus indicating a role for these gene family members in metastasis. 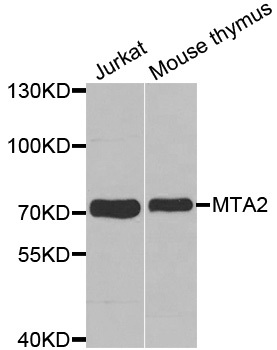 MTA2 Polyclonal Antibody. Unconjugated. Raised in: Rabbit.